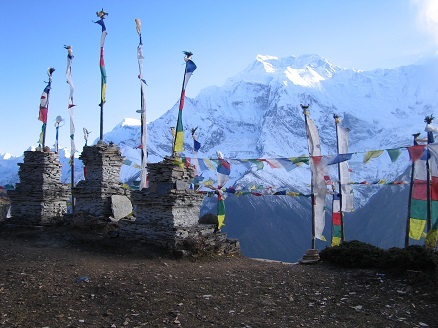 The Annapurna region provides very special trekking experiences with unique culture and sceneries. 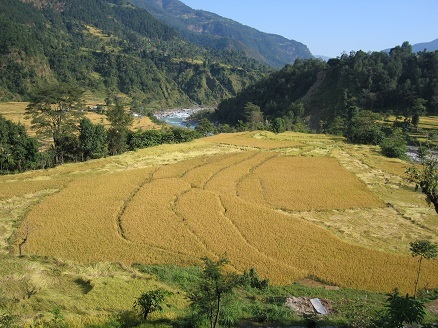 We welcome you for the various possibilities in this region. We have designed flexible itineraries to address your time and budget needs. 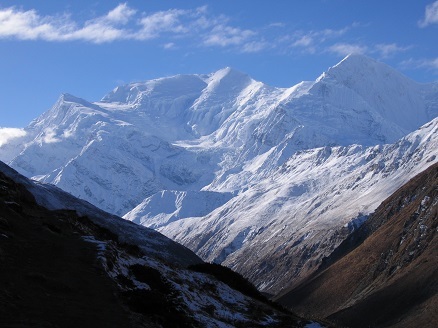 The Annapurna is a big range of mountains, including one of the fourteen 8000 m in the world, the Annapurna I at 8091 m, and many high secondary summits, Annapurna II, III, IV, South at more than 7000 m and some 6000 m tops. 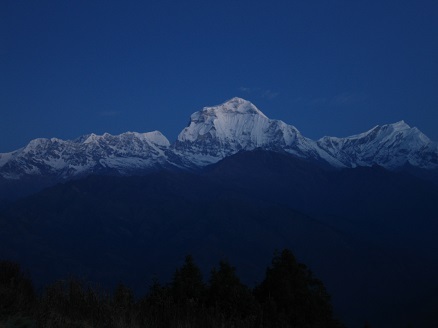 At the West, stands the Dhaulagiri at 8175 m. In between, the deepest valley of the world where flows the Kali Gandaki. 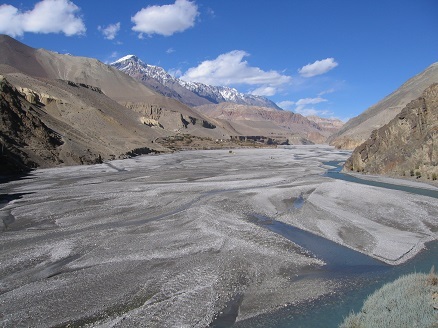 The ethnic Thakali village Dana is located in the edge of this river. 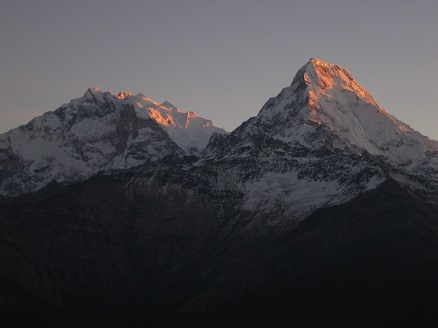 Many other peaks can be seen when hiking in this region: Machhapuchhre, Nilgiri peak, Tilicho peak, Himlung Himal and Gangapurna peak. 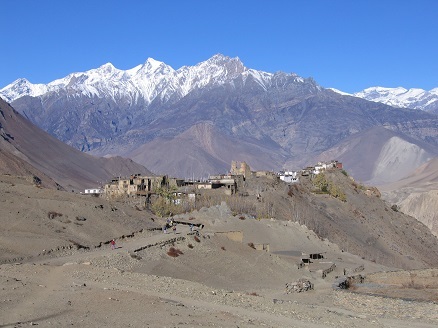 The region is very varied, agricultural fields up to 3500 m, low yak grass up to the high pass, very dry and mineral when arriving Muktinath and Kagbeni, the door to the Mustang region. 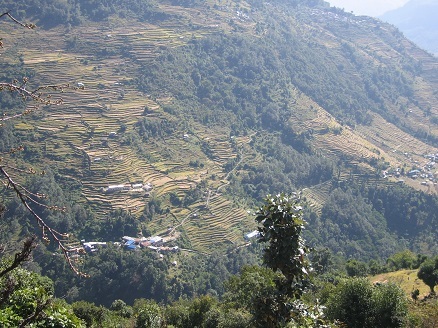 This region is protected by the ACAP (Annapurna Conservation Area Project) and this make the flora and fauna very rich. 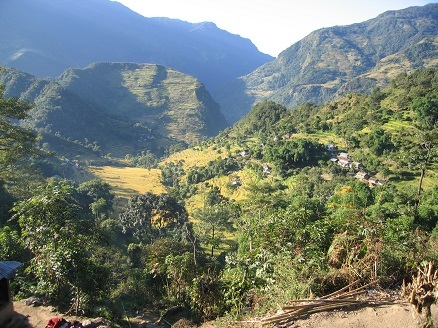 Both Pokhara and Besisahar are below 1000 m and their climate is quiet tropical and the landscape includes many terraced fields. At the higher altitude it is forest trees including oaks, beeches and rhododendrons then at the highest pine trees and junipers. 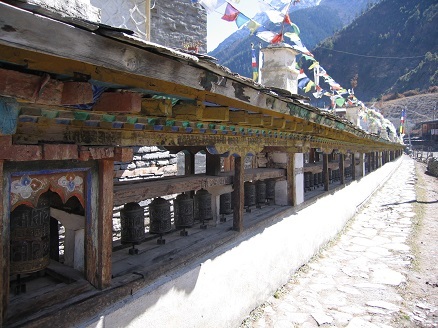 The fauna is composed of many birds, the most obvious being the pika, blue ships and Himalayan Tahrs. 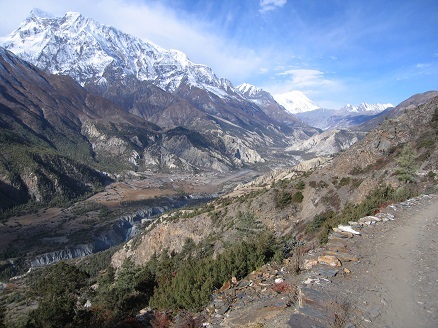 The only challenge for the complete tour is to cross the Thorong La, but thanks to 4 to 6 days of hiking in the valley before reaching Manang at 3540 m, the acclimatization process works well. 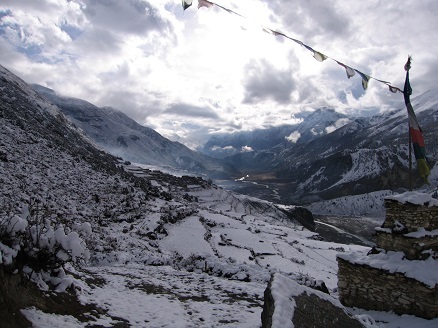 The only thing to take care about is to spend 2 nights in Manang. 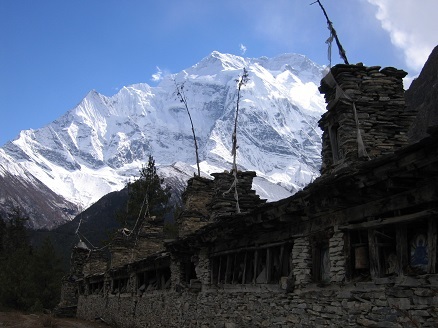 If you start from Phokara and plan to go only in the Annapurna Sanctuary, spend at least 3 nights before spending 1 night in the ABC. 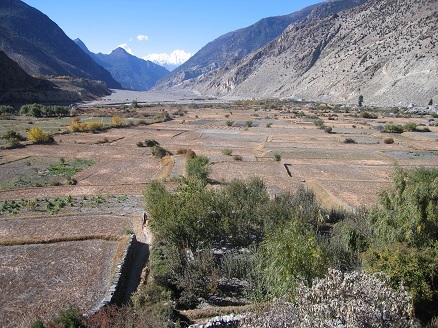 For the complete tour, you should take a bus from Kathmandu to Besisahar, nearly 1 day. 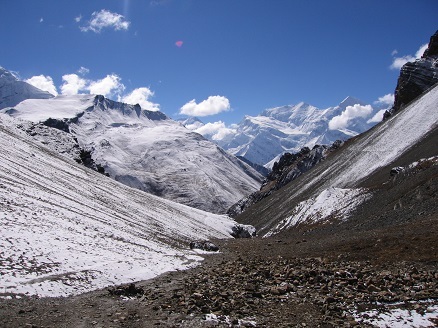 After crossing the Thorong La, you may continue by hiking on the historical path but in the higher season many jeeps take the track and create dust. 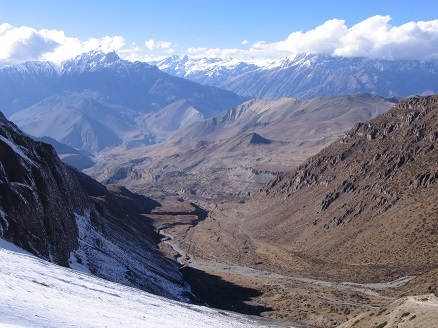 Since the road was opened, many trekkers now take a Jeep from Jomson or Muktinath to go back to Phokara. In the lower season, December for example there are less tourists, so less jeeps. 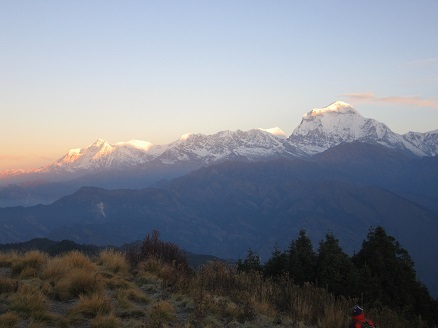 In order not to miss the very beautiful Ghorepani point of view, the path free of vehicles from Tatopani to Birethanti or Nayapul should not be missed. 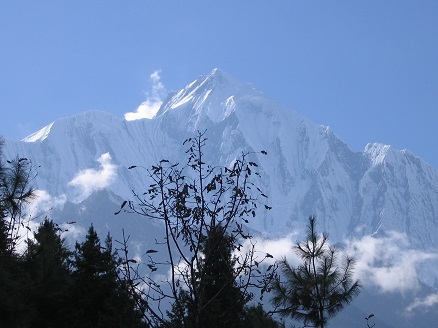 For the Annapurna Sanctuary, you should take a bus from Kathmandu to Phokara, nearly 1 day. The entry in the ACAP area is submitted to an entry fee.